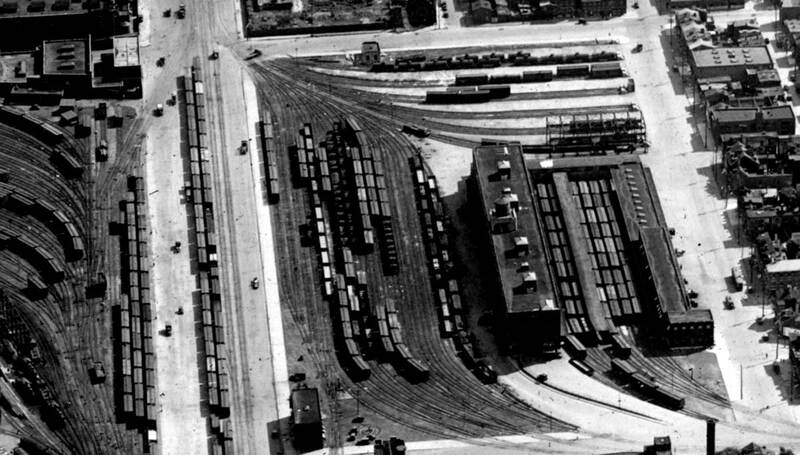 There are two team yards in the original aerial photograph. 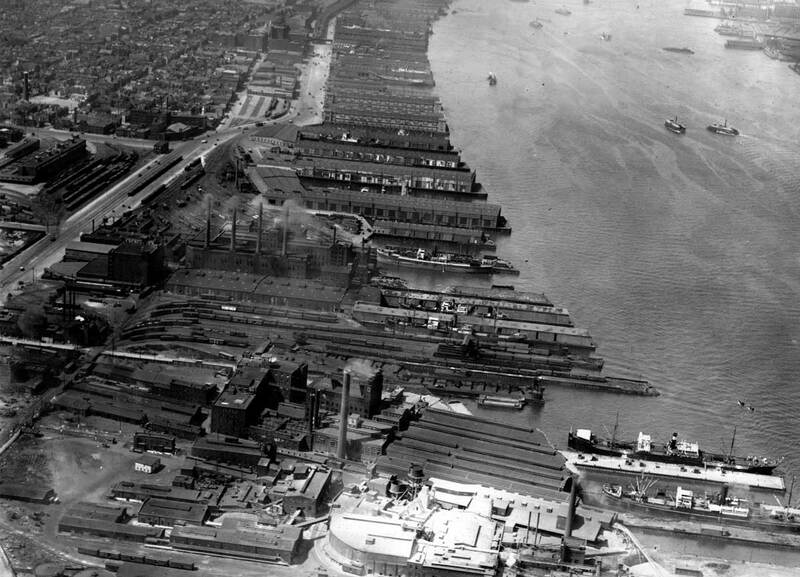 The above image is a crop to focus on the team yard in the lower center of the original view. While undated, I think these photos date in the 1930-1935 period. 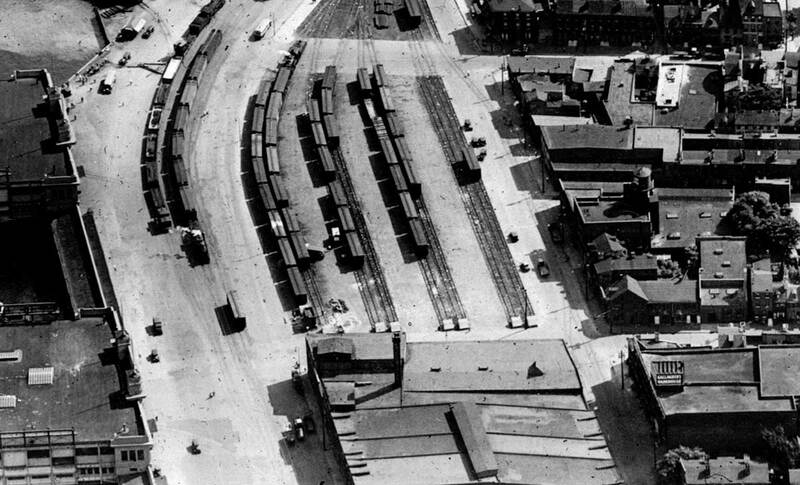 The person who sent the image said this was Delaware Avenue in South Philadelphia, but I wasn’t certain exactly where along Delaware Ave.
Here’s the other team yard and a large freight house. Another aerial image from a different angle reveals Merchants Warehouse lettering on the building. As you can imagine, there were lots of smaller industries. Here’s that other angle on the area. The big question is who owns these tracks? These can’t possibly be all owned by one railroad. Where do we turn? Maps are a good bet. Penn State University has an extensive collection of Sanborn Fire Insurance Maps available to view online. These often show railroad right-of-way and ownership, but are often sketchy on precise track geometry. I found a 1917 Sanborn Fire Insurance map book that covers this stretch along the Delaware River. On the right side of that page are a list of links to the individual maps. Click on the Key page to review an index map to find the sheet for the area you want in detail. Sheets 420, 430, 461, 462, and 463 are most helpful for these aerial images. The Sanborn map denotes this line along Delaware Ave. as the Pennsylvania, Philadelphia, & Reading and Belt Line RR. It sounds like a jointly owned operation and a couple of Google searches later a short history on the Philadelphia Belt Line was on the screen. Three railroads jointly operated this line. The Philadelphia & Reading (Reading after 1924) had access to the entire line, while the Baltimore & Ohio and Pennsylvania Railroads had access between certain points. I turned to my trusty 1922 B&O Form 6 Official List of Officers, Agents, Stations, Siding and Mileage to dig up more dirt. These are great research tools and several volumes are available from the B&ORHS Company Store. 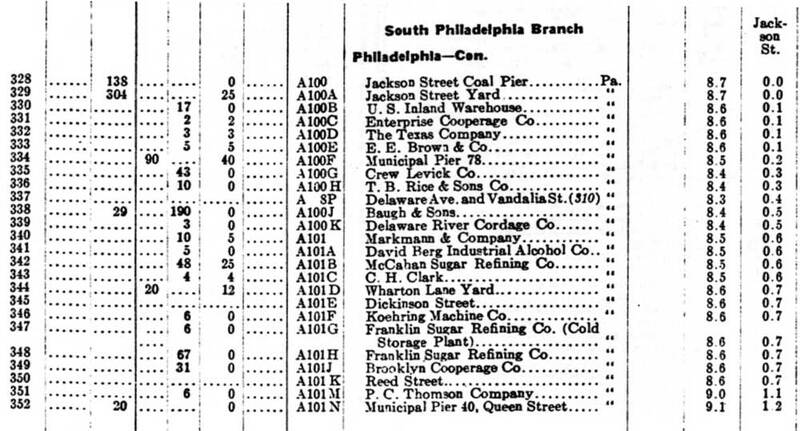 There are listings for Delaware Branch and the South Philadelphia Branch detailing about 14 miles of track and a variety of customers including coal dealers, cooperages, chemical plants, piers, and sugar refineries. Here’s a portion of the data. Note this covers less than a mile of track. The far right numbers are index references. The other numbers are car capacities. The blank column is passing, then Company, Joint, Private, and Loading or Unloading Capacity. The numbers beginning with A are station numbers. The numbers on the right are mileage from Park Junction and Jackson St. I didn’t expect to dive in and learn this much from one photo, but crazy things can happen when curiosity strikes. 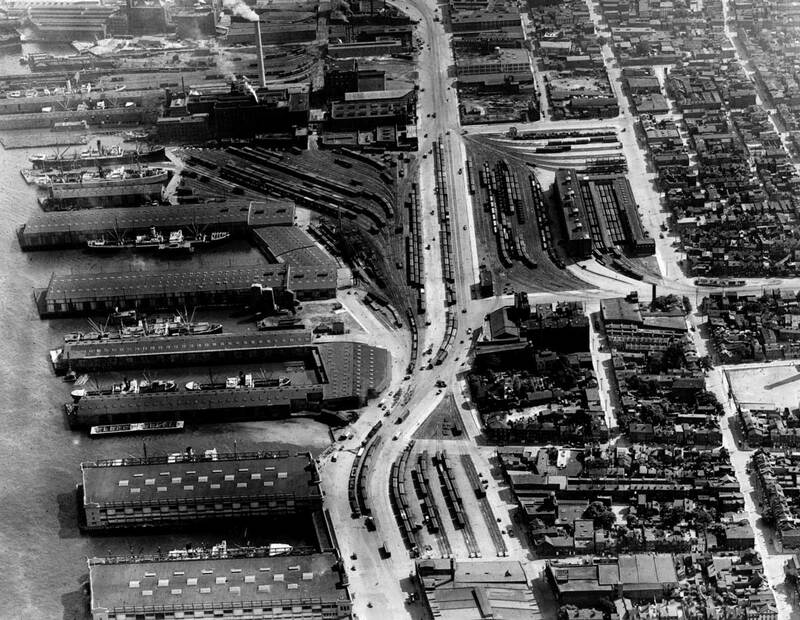 There are four aerial images of this area of Philadelphia. They can be found in the Barriger PRR Philadelphia Terminal album on Flickr. These type of urban rail and industry corridors attract my attention from modeling and historical perspectives. In many cases, more than one railroad can be modeled and the industry base is varied. Even a small portion of this area would make for an interesting model railroad with lots of operational possibilities. We are lucky to have a few of these images available to review. These industrial corridors are usually separated from the busy mainlines that attracted railfans and photographers over the years, so documentation is often sparse. Cities are constantly renewing their landscape and demolishing old industries to make way for modern needs. Today, Home Depot and a WalMart Supercenter occupy a portion of this area. Thanks for visiting the blog and reading the latest post. Feel free to share a comment in the section below. Please follow the instructions so your comment can be posted. All comments are reviewed and approved before they appear. Do you have an “package” or “merchandise” car schedules? If not, I have some spreadsheets on a few roads that I would be happy to share with you if you like. Thanks for showing the investigative process you went through, the links to the information, and, especially, many thanks for the entertainment value! While my layout is keeping me plenty busy, I do have a plan for an industrial switching layout for another room. It will be pre-1929.